Free Fitness Friday: Intervals for the Win! It’s finally Friday!! Once again, the week flew by and we are already approaching the weekend! I truly don’t know where the time goes, but I know how important it is to make the time to exercise – even when I am short on time! Time really is of the essence and it may be difficult to fit in a cardio workout throughout the week, but I have great news for you! You can still get the health benefits of cardiovascular exercise in a quick 25- minute workout when you incorporate Interval Training - and you will burn twice as many calories with Interval Training in the same amount of time! Now that’s a win, win situation if you ask me! The beauty of Intervals is that you can perform any cardiovascular exercise that you wish in nearly any setting that you desire– walking, jogging, sprinting or running the stairs outdoors; walking, jogging, and sprinting on the treadmill inside; or on the stair-master, rowing machine, elliptical, or spin bike in your house or gym – and you are able to perform the exercise at a higher intensity throughout the 25-minute workout. 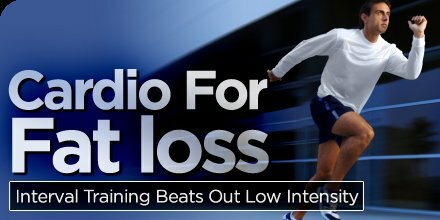 The key is performing the exercise at intervals of low intensity (to rest and recover) and higher intensity (to get your heart-rate up and torch some serious calories). The intensity of the exercise is based on YOUR OWN rate of perceived exertion (RPE) and it is important to rest and recover during the lower intensity and to really push it during the higher intensity intervals. Here is a table that lists and describes the RPE method for setting the intensity level for your intervals. Use this chart when setting your intensity levels throughout the interval workout and be sure to warm up for the first 3 minutes at a “light activity” factor (2-3 on the RPE scale) in order to warm up the body and prepare yourself for the higher intensity work. Similarly, be sure to cool down during the last few minutes at a “light activity factor” (2-3 on the RPE scale) in order to allow your heart-rate to come back down to near resting levels and end your work out with a full body stretching session to reduce soreness and prevent injuries. Here’s the workout! It’s only 25 minutes long (including the warm-up and cool-down) and it will be over before you know it! Trust me, you will feel the burn and will feel amazing when it’s over! Now that you understand how to use the RPE chart and have the Interval Training workout in front of you, let’s get this workout started! Set your first interval speed and get going! Have a blast “blasting” some serious calories and have a wonderful weekend ahead! Happy Friday!! I don't know about you, but this week seemed to drag on and on and I was running around like a chicken with my head cut off all week! Well, it's finally Friday and time to squeeze in this week's FREE workout! I was short on time this morning, but had an absolute blast (and blasted some serious calories) with this quick 20 minute HIIT / Tabata workout. I played around with some recordings of each exercise to demonstrate how they are done, but I am still working out the issues with editing and sharing videos! Bear with me as I learn the ropes of editing media, but at least you click the YouTube links and be able to see how each exercise is done and ensure that you have proper form! As always, you want to start with 5-10 minutes of an easy warm-up and finish the workout with at least a 5-minute cool-down and stretch! The whole workout takes 20 minutes (30-45 minutes total with the warm-up and cool-down) and you'll be surprised with how much fun you'll have while burning some serious calories! Complete each exercise (1-5) for 20 seconds of high-intensity work ("on") with a 10-second rest ("off") between each exercise until you complete the 5th exercise - that is one (Tabata) cycle. For example, do the burpees (with the jump) for 20 seconds, rest for 10 seconds, then move onto the right leg step-ups for 20 seconds, rest for 10 seconds, then move onto the left leg step-ups for 20 seconds, rest for 10 seconds, then move onto the plank with tricep press for 20 seconds, rest for 20 seconds, then finish with the plank with scissor jumps for 20 seconds. Rest 10 more seconds before moving onto the next cycle. Repeat the cycle 5 more times (for a total of 6 cycles) and then cool down for another 5-10 minutes (depending on how much time you have). You can choose any form of cardiovascular exercise to cool down, but don't skimp out on the cool- down! It's important to allow your heart-rate to come back down to near-resting levels AND stretch after a high-intensity workout! Here are the YouTube links for demonstration purposes. The first video is me performing the burpee exercise, the second video is me performing the right leg step-ups and the left leg step-ups, and the third video is me performing the plank with tricep press and the plank with scissor jumps. Have a blast (while blasting calories) and have a wonderful weekend ahead! That's right! Your eyes are not deceiving you... I did say "FREE"! Every Friday I will post a FREE workout that you can do nearly any where, any time - especially when you are short on time. I know how difficult it may be to find the time to work out during the work-week (especially on a Friday) but there's no better way to de-stress from the hectic week at work than to exercise! With these quick and effective workouts, you will be able to reduce your stress, blast some calories, and set yourself up for the weekend ahead! Seriously, these workouts are only 20-30 minutes long and can be completed nearly anywhere at any time! So.... what are you waiting for? Let's get to work! Then you start your timer - I was introduced to the Interval Timer app by a dear friend (Lindsey) and absolutely love it! The timer is so easy to use and you can download it on your smart phone to use during your workout. If you don't have a smart phone, you can easily use a stop watch. Complete each exercise (1-5) for 20 seconds of high-intensity work with a 10-second rest between each exercise until you complete the 5th exercise - that is one (Tabata) cycle. For example, do the kettle bell swing for 20 seconds, rest for 10 seconds, then move onto the ring pull-ups (TRX pull-ups) for 20 seconds, rest for 10 seconds, then move onto the wall ball for 20 seconds, rest for 10 seconds, then move onto the plie' squat for 20 seconds, rest for 20 seconds, then finish with the plank and pike for 20 seconds. Rest 10 more seconds before moving onto the next cycle. Repeat the cycle 5 more times (for a total of 6 cycles) and then cool down for another 5-10 minutes (depending on how much time you have). I had extra time this morning and chose to do the stairmaster for 10 minutes, but you can choose any form of cardiovascular exercise to cool down. Don't skimp out on the cool down! It's important to allow your heart-rate to come back down to near-resting levels AND stretch after a high-intensity workout! !